Moto X has got its own place in the smartphone market, because of its distinct and unique features.To enable the best feature in moto X, it is necessary to root the smartphone. Rooting moto X, running on Android 4.4.4, is outlined in Igadgetsworld. 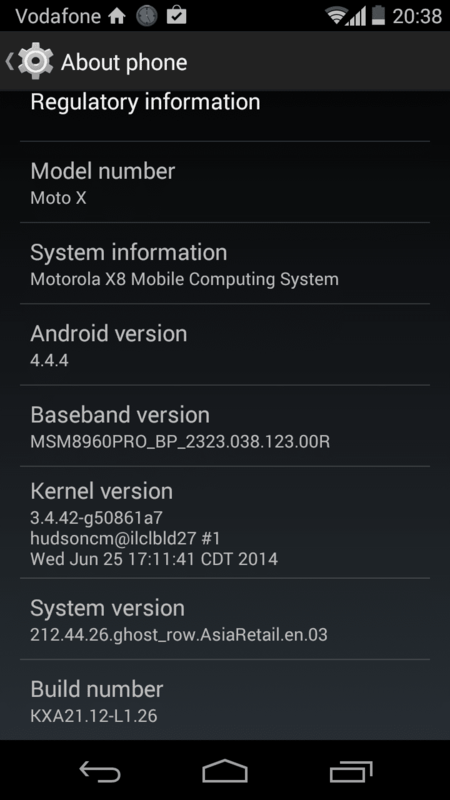 Read more how to root Moto X running on Android 4.4.4. Before rooting moto x, it is necessary to unlock the moto x bootloader. Here we provided step by step process how to unlock Moto x bootloader running on android 4.4.4. We’re getting comments as many of the users are facing issues while unlocking the bootloader in Moto X and it’s hard to answer each and every comment as the Editors team are on vacation, so kindly leave your problems/doubts over mail to : editor@igadgetsworld.com with subject line: “Unlock moto x bootloader” and add relevant images + proper description of your problem, the team will get back to you in less than 24 Hours. Download the package of motorola usb drivers, adb, fastboot, mfastboot and recovery drivers. This is the one place, where you will get all the necessary drivers needed for your Moto X. The download package is developed and provided by “Elemental Designs”. After downloading the package, extract all the files into a single folder and name the folder as “MotoX”. Except SuperSu 1.86 for Moto X and Fastbootghost, you can see remaining files been extracted into the folder “MotoX”. Check the screenshot below for better understanding. Sometimes, when you connect Moto X in fastboot mode, windows 7,8 may not install the drivers for fastboot mode. If the installation of drivers for fastboot mode fails for Moto X, then it is necessary to download “Fastbootghost” drivers, which has to be installed manually from device manager, find “fastbootghost”, right click, install driver manually and select the folder downloaded folder and install it. Download Fastbootghost for Moto X here. Once you are done with installing of “Motorola device manager” and “fastbootghost”, now it is necessary to activate “Debugging mode” in motox. Developer mode can be enabled in Moto X by clicking “Buildnumber” three times. This acitivates the developer mode and check the “debugging mode” to start the unlocking of bootloader. Now open the “Moto X folder”. 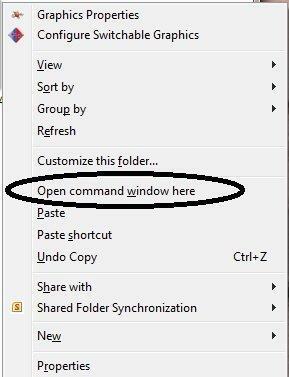 Inside the Motox folder, by holding the shift key, right click on the mouse and select the “Open the command window here”. It opens the command prompt. Enable USB Debugging on your phone. The above command reboots your device into fastboot mode. Soon the device restarts into the fastbootmode, drivers starts installing automatically. If fastbootmode drivers installation fails, download “fastbootghost drivers“ from above link and install them manually from device manager. Soon you enter into fastboot mode, now lets navigate to Motorola website. Click here for link. Enter your motorola login and password. Before generating your “Unlock code”, from Motorola website, it is necessary to carry to next step. 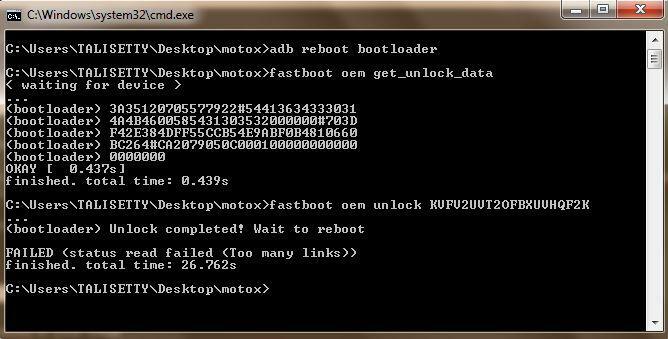 Type the following in the command prompt: fastboot oem get_unlock_data. 9. Copy the string code from command prompt, without “bootloader” and spaces. The string code should be like this “3A35120705577622#544136343330314A4B4600585431603532000000#703DF42E386DFF55CCB54E9ABF0B4810660BC264#CA2079050C0001000000000000000000”. Paste together the 5 lines of output into one continuous string without (bootloader) or ‘INFO’ or white spaces. And click on the “can my device be unlocked”. It should enable the generate my unlock key button. Once you click the button it will enable a ‘REQUEST UNLOCK KEY’ button at the bottom of the page. Click the request button and it will email you the unlock code within a few minutes. Once you receive your unlock code proceed with step 10. 11. *UNIQUE_KEY is the unlock code you received in your email You are now unlocked! Now we have successfully unlocked the bootloader of Moto X running on android 4.4.4. Soon you unlocked the bootloader, now it is time to root moto x running on android 4.4.4. It’s 2017! Quit Being Single, and Mingle with someone by Installing a Dating App – Choose one from the Ten!